The new labor campaign against the retail giant faces daunting odds, and the stakes are high: most of us live in the Walmart economy. Labor strife at Walmart is nothing new. But in the retail giant’s half-century of existence, it’s never looked like this. On the heels of a series of failed organizing campaigns, unions and their allies are mounting the strongest-ever North American challenge to Walmart. The new campaign faces daunting odds and extreme versions of the hurdles facing US workers everywhere: employers on the warpath and labor laws tilted against employees. But with a new organizing strategy and a savvy focus on Walmart’s supply chain vulnerability, this attempt has come closer than any at forcing change from the dominant player in our economy—a necessary task if there’s ever to be a robust future for the US labor movement. Even though Walmart employs just under 1 percent of the American workforce, most of us live in the Walmart economy. Its model has been forced on contractors and suppliers, adopted by competitors and mimicked across industries. That model includes a relentless squeeze on labor costs. In the United States, workers say they often skip lunch to get by on paltry wages. In Bangladesh, where in late November 112 workers died in a factory without outdoor fire escapes, NGOs blame Walmart for pushing deadly shortcuts. The ruthless cost-cutting is sustained by fierce unionbusting. In an era when intimidation campaigns are routine, Walmart has set itself apart, responding to union victories by shutting down an entire store in Quebec and eliminating all its meat-cutting departments in the United States. American labor laws allow Walmart ample opportunities to crack down on organizing, from holding mandatory anti-union meetings to illegally firing union activists, with little risk of anything more than a slap-on-the-wrist fine and being required to post a notice promising not to break the law in the future. It’s bad enough that our broken laws give companies nearly free rein to bully workers. But they also fail to keep a promise dating from the Wagner Act of 1935: that it is up to workers, not management, whether employees form a union and bargain collectively with their boss. Because the government-supervised union election process is rigged in favor of employers, and because companies can stonewall negotiations even if they lose elections, unions can’t be victorious unless they break the boss’s will to crush them. Walmart is used to getting away with it. In the mid-2000s, major unions—including the Service Employees International Union (SEIU) as well as the UFCW—invested in an array of efforts under the banners Walmart Watch and Wake Up Walmart. There were sophisticated media war rooms and partnerships with feminist and environmental groups. There was a union-funded film featuring workers’ accounts of workplace injustice intercut with small-business nostalgia, patriotism and horror stories about crime in Walmart parking lots. All of the top 2008 Democratic presidential contenders criticized the company. But eventually the campaign fizzled. One of the veterans of those efforts, two-decade Wisconsin retail worker Jackie Goebel, said being flown to Washington, DC, to meet other Walmart workers was an eye-opening experience. But after she got back, she added, “it was kind of like they dropped off the face of the earth.” In contrast, the latest wave of labor resistance has “picked up steam.” Three days after we talked, Walmart retail workers were on strike. The current strikes grew in part from under-the-radar skirmishes during the past year in individual stores, where workers organized their co-workers and confronted managers over local issues. Such actions don’t draw national headlines, but they challenge Walmart’s authority more directly than gatherings in Washington—and they did much more to build a base of workers ready to strike. This past fall at the Walmart store in Pico Rivera, California, a group of workers demanded a meeting with management about issues including understaffing and retaliation, only to be rebuffed. Days later, on October 4, nearly a third of the store’s 100 morning-shift workers struck, anchoring a coordinated work stoppage at several stores—the first such action against Walmart in US history. American strikes, like American unions, have been in a multi-decade decline. But as Walmart workers are showing, they can still pack a punch, engaging customers, the media and fellow workers in a way that no press conference can. The numbers from November—more than 500 strikers in the days leading up to and including Black Friday—show significant growth since October, when 160 retail workers walked out. But that’s still less than one out of every 1,000 US employees. The question is: How much bigger can the strikes get? According to Colby Harris, who said he struck his Lancaster, Texas, store alone in October, he was joined by at least ten co-workers on Black Friday. He said that seeing those strikers return safely to work gave half a dozen of his co-workers the courage to take a smaller step: signing up as members of OUR Walmart. “It seems like a lot more people are willing to take actions the next time we do that,” says Harris. Workers say the numbers would have been much larger if not for an onslaught of management intimidation, which included a Walmart vice president’s repeated comments in the press that workers who didn’t show up could face “consequences.” Harris says that after that statement, “a lot of associates” backed out of striking. While OUR Walmart isn’t calling for union recognition, it’s no secret that the UFCW and many workers would like to see a union at Walmart. Under our broken labor laws, no union bargaining—indeed, no negotiations with workers of any kind—will happen unless Walmart allows it. The retail giant has shown that it will do nearly anything to avoid conceding power, from dramatically improving its drivers’ jobs to ward off the Teamsters in the 1980s, to putting stores where there was labor unrest under the control of expensive anti-union consultants in the 1990s. Even the company’s high turnover costs may be a willing sacrifice of efficiency for the sake of having a workforce that’s less permanent and thus less likely to unionize. Can the workers force Walmart to recognize a union? Labor historian Nelson Lichtenstein is more skeptical. “We should be strategically pessimistic,” says Lichtenstein, who directs the Center for the Study of Work, Labor and Democracy at the University of California, Santa Barbara. “Union recognition in the classic sense will not be achieved in the absence of something truly radical happening in the country.” Lichtenstein, author of The Retail Revolution: How Wal-Mart Created a Brave New World of Business, says the recent strikes were “terrific,” but predicts that weak labor laws, high worker turnover, and Walmart’s intense anti-union management culture and well-honed unionbusting will present insurmountable obstacles to unionization. Lichtenstein says it will be months before we’ll know whether Walmart is able to force out the workers who struck; if they keep their jobs, “it would be a tremendous victory.” Over the long run, he said, if OUR Walmart can persist and grow, it could achieve changes in Walmart’s business model even without securing formal unionization. That could happen in two ways: first, by creating political momentum that forces the federal government to improve pay (such as a long-overdue increase in the minimum wage) and conditions for the working poor; and second, by forcing Walmart to make concessions to workers in order to avert greater unrest. Someday, says Lichtenstein, if that strategy improves workers’ jobs enough that turnover decreases and workers see OUR Walmart as powerful, union recognition would be a more realistic possibility. Two strengths have set the current campaign apart from previous efforts: intensive leadership development in individual stores, and organizing throughout the supply chain. Social media have played a role, helping to spread the strikes to previously untouched stores. But organizers note that given the serious risks involved, workers were much more likely to turn out in stores where co-workers had already spent months pushing them and confronting the boss. Meanwhile, although the sight of retail employees on strike has drawn the greatest public attention, it is the workers in Walmart’s supply chain who have scored the biggest victories. Strikers at the corporation’s distribution center in Elwood, Illinois, which handles the majority of its imports, won the reinstatement of four fired workers and full back pay for their three weeks on strike. A top Walmart official met with a few warehouse workers from California and Illinois, an opportunity the company has been loath to extend to retail workers. And the lead organizer for the National Guestworker Alliance, a group a Walmart spokesperson dismissed this past summer as a union front, says Walmart has reached out about scheduling a meeting. These concessions demonstrate Walmart’s increased willingness to meet with workers it claims are not its employees. They also reflect the disproportionate power such workers have to disrupt Walmart’s business.As in the previous decade, Walmart faces a comprehensive campaign targeting the company’s multiple vulnerabilities and incorporating multiple allies. Community activists recently defeated Walmart expansion efforts in Denver and New York City. Congressional Democrats are investigating Walmart bribery abroad. Feminist groups have revived, as state-level class actions, the Wal-Mart v. Dukes gender discrimination case, which had been the country’s largest-ever employer-discrimination class action suit; it was quashed by the Supreme Court in 2011. NGOs are challenging Walmart’s handling of contractors and suppliers, from warehouses in California’s Inland Empire to the shrimp industry in Bangkok. And although national politicians have been largely silent on the campaign, organizers plan to engage them in the new year. Walmart has survived such threats in previous years. But none of them were joined with the kind of worker unrest now roiling the company. In the past, says Columbia University political scientist Dorian Warren, Walmart has been able to “attack the critics as these liberal elitists” who are “hurting poor people… Now you have all these workers being willing to go on strike because they’re fed up. That sends a signal to a lot of other workers.” Warren adds that although the UFCW is “not the most innovative union,” its current campaign has the potential “to usher in some hope and innovation” throughout the labor movement. Following Black Friday, organizers pledged an immediate focus on aggressively confronting management retaliation while stepping up outreach to Walmart customers. But workers have vowed to strike again soon—and bigger. “I hope that we can do it once a week,” said Miami striker Elaine Rozier. And the UFCW’s Dan Schlademan had promised weeks before that the Black Friday strikes would not be a climax but rather “a new permanent reality” for Walmart. On December 14, the global labor federation UNI coordinated actions by Walmart employees in nine other countries in support of their US counterparts. Meanwhile, workers who led the CJ’s strike are organizing others in Walmart’s supply chain. The Walmart campaign comes at a moment flush with signs of labor’s vulnerability as well as its vitality. In Michigan this past December, a Republican-controlled legislature and Republican governor passed a law that turned that historic union stronghold into the country’s newest anti-union “right to work” state, where employees in union shops can’t be required to pay representation costs. But recent weeks have also seen a series of significant strikes. On November 27, unionized clerks at the ports of Los Angeles and Long Beach mounted a week-long work stoppage; fellow members of the longshore union honored their picket lines, holding up billions of dollars’ worth of cargo and beating back proposals to increase outsourcing. On November 28, 200 fast-food workers in New York City held an unprecedented one-day walkout to kick off a campaign for union recognition in that low-wage, nonunion industry. 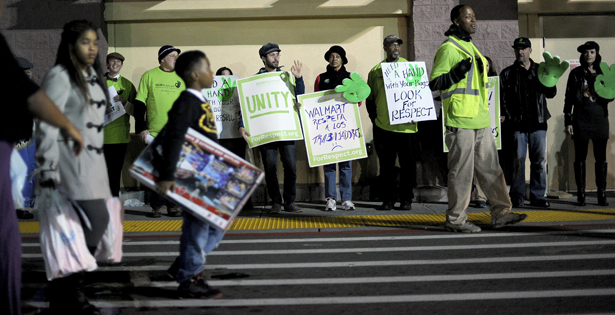 Taken together, the strikes by port, fast-food and Walmart workers offer three key reminders. First, that workers will be able to gain significant power if they can disrupt supply chains. Second, that solidarity isn’t circumscribed by profession: workers who haul freight walked off the job in solidarity with clerks who work at their desks, just as Walmart greeters drew inspiration from their distribution center counterparts. And third, that strikes—though hamstrung by the law and battered by outsourcing—are still a potent means of worker organizing. If Walmart workers are to have a chance, it will take a campaign of years, not months, and strikes involving thousands, not hundreds. But in an era when organized labor is on the ropes, and when most victories are defensive or only partial, they’re making labor’s chief antagonist sweat. And through steady organizing and great courage, they are challenging Walmart’s low-cost business model.